House Price to Earnings: House price to earnings ratios have risen to 4.9 from 4.2 in the last few years. The long term average is 4.1 and the all-time high in 2008 was 5.9. The all-time low in 1995 was 3.3. So we are resting half way between the all-time high and long-term average. Clearly property prices are not cheap – neither are they as expensive as they could be. Many regions house prices are languishing around a ratio of 3.5 – like South Wales and NE England. 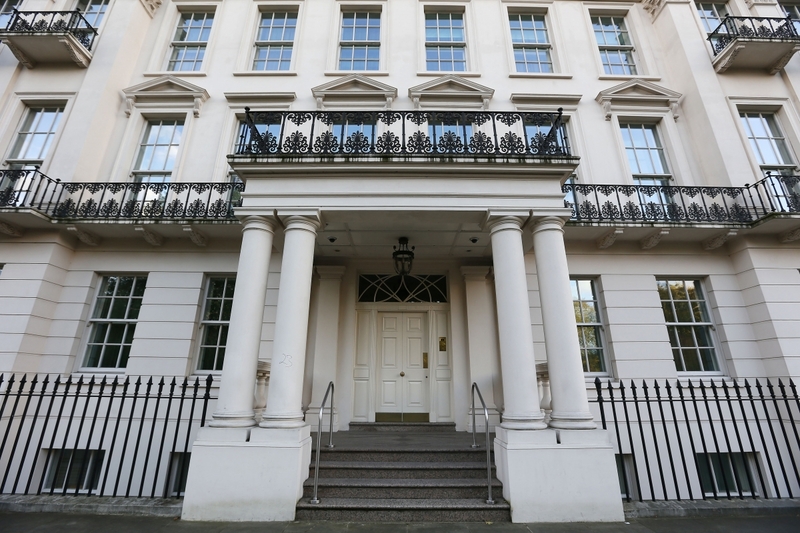 London has a house price to earnings ratio of about 10, though arguably this market is completely different and driven by international property investors. Pick Up March 2013: Property prices have risen sharply since March 2013 when the announcement of Help-to-Buy coincided with a Spring pick-up in the property market and a general pick-up in economic activity. 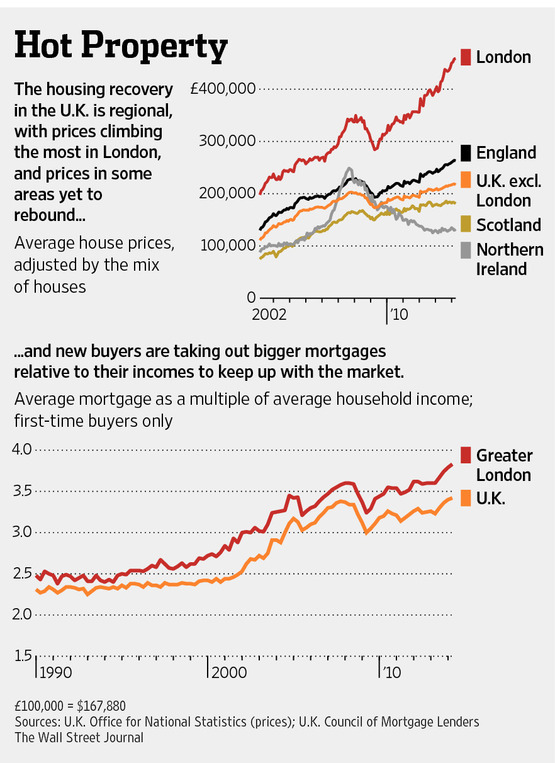 In London – prices have roared ahead. The ripple is now fanning out across the country through SE England into the Midlands and wealthier parts of Manchester-Leeds. Jumping In: If you look at the absolutely miserable period between 2008 and 2013 – five years of depression in most of the country - we see a picture of the people jumping onto the market that previously held off from buying property because of: 1) the uncertainty in employment, 2) lay-offs in manufacturing and public sector; 3) risk-aversion; and 4) high/new student loans indebtedness. Aging of First Time Buyers: The average age of the first time buyer shot up during the period 2007 to 2012. The question is – how long can people put off buying a property before they finally want to take the plunge. It was not surprizing this pent-up demand started to show itself. In theory five years-worth of first time buyers were ready to take the plunge. In reality, the amount of first time buyers has been far more subdued – only a recovery of sorts. But these buyers have helped kick-start the property market and are helping to support property chains of people trading up. In the last 10-15 years, the average age of the first time buyer has risen 5 years. No Change: This is not likely to change any time soon. For the last ten years, the population has been booming particularly in London/SE England. The UK has needed to build about 320,000 properties a year for the last ten years, but the industry has only been building 100-150,000 properties a year. Most people want to live in houses. Almost all the properties build are flats. All the talk of a building boom is way over played – it’s not going to happen because of the Nimby factors. Councillors Want Votes: When you get down to the local politics, the councillors require votes to be elected into seat. Almost without exception, there are no votes to be won by supporting new building and developments – especially on greenfield sites or nice areas. Whenever the electorate complain to the councillors, the councillors will naturally want to block planning-developments, vote them down. What we are saying is that the Nimby factor is then amplified by Councils and local councillors working with planning departments. There seems to be no votes or public sector job security in pressing for new developments. There seems to be votes and public sector job security for appearing keen to stop or slow down developments. Some exceptions probably exist in blighted areas, also with high immigrant populations that are not used to the typical UK Nimby factor – this is likely to have helped the Stratford Olympic Development succeed in its gigantic regeneration within Newham district in London. Rising Rents or Rising Prices – Sometimes Both: For property investors, the lack of new property supply is an opportunity for higher capital price appreciation on existing homes – although rental yields drop in this scenario over time. Overall yields stay healthy though. The lack of supply also creates a squeeze on the number of properties available for rental as a housing shortage gets worse – this then leads to rents rising. As first time buyers jump into the property sales market, rental demand drops somewhat and rental prices soften. This is what we have seen since mid-2013. A buy-to-let investors will then make less return on the rental yield but more retain on yield from property price appreciation – capital appreciation rather than operating income. When the property market slows, and people sit on the sidelines and prefer to rent, as they did in the period 2010 to 2013, rental prices skyrocket as there is not enough rental property to go around. Once rents rise, then many of the people renting find it cheaper to purchase a property and then jump into the property sales market classified as first time buyers – something we have been seeing since March 2013. Recession Close By? The big question is, is this the start or the end of an economic recovery? If you read the mainstream press, everything seems to point to it being the start. But we are not convinced. If you were a sceptic, you would say it’s been 5-6 years since the last deep recession and we are due another one soon. However, if you are ultra-sceptical, you might say that the north of England has been in a depression for 5-6 years and it is due a recovery! Two Speed Economy: What we have is two different economies – 1) London/SE England, and 2) Everywhere else. 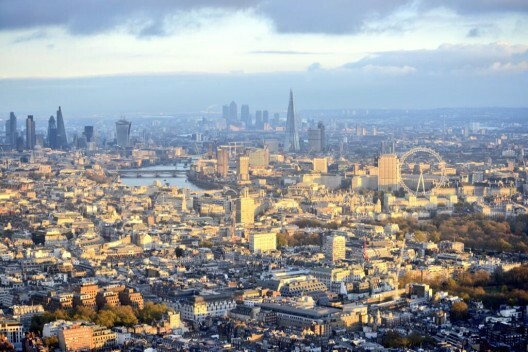 London has been booming for years – both in terms of population, GDP growth, investment and prosperity. Meanwhile places like mid Wales, Middlesboro, Hull and Cumbria have been in a deep Depression (e.g. multi-year recession) for most if not all of the last 6 years. Eventually prices in London will be so high and prices in Middlesboro so low that investors will move in and prices will start rising in Middlesboro – but this is still some way off and may never happen. 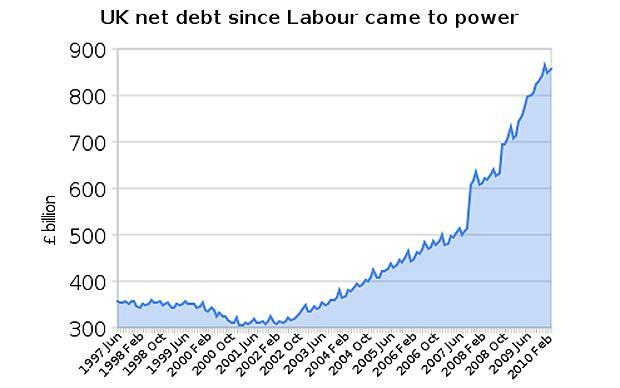 Debt Explosion Under Labour: Labour's Gordon Brown presided over a Treasury that increased government debt from £340 billion in 1997 when he took over to £870 billion - a gigantic 250% increase in 13 years. Meanwhile in 2003 Gordon Brown also sold most of the UK's gold reserves at record low inflation adjusted prices of $290/ounce (the price is now £1270/ounce) - losing £60 billion of value for UK citizens - cementing the Labour party’s poor reputation for economic management of government and British citizen’s finances. Ed Miliband and Ed Balls are waiting in the wings, career politicians, to take on the UK finances in 2015 if voted into power. They promise even more left wing socialist high spending high tax policies than Brown implemented - that would undoubted create another financial and economic crisis and high unemployment. 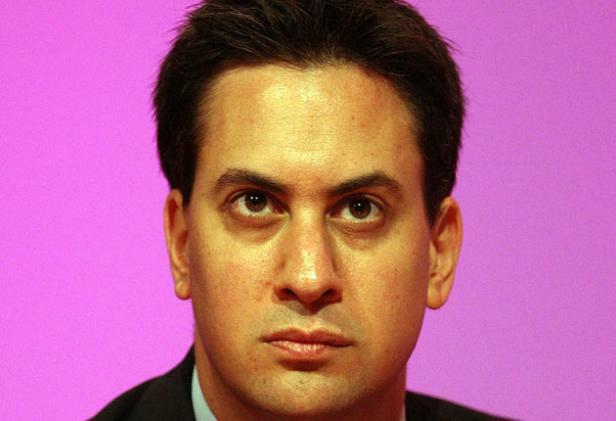 Labour Threat: Ed Miliband is more likely to get a majority than David Cameron. Ed Miliband is a socialist who is far further left-wing than Gordon Brown, who was himself further left than Tony Blair. We can assure you Ed Miliband and Ed Balls - would spend until the money ran out then more until there was a crisis, in part because they do not have no experience in business, economics – and appear not to understand what pays their salaries (e.g. private sector taxes). This is because they are both career politicians from privileged backgrounds who have been detached from the real world since birth. Ed Miliband and Labour are thought of by many as unelectable partly because he just does not feel like a credible head of state and partly because people still don’t trust Labour to manage the economy. However, with so many small urban seats, Labour need 2% less of the vote to get a majority compared to the Conservatives – and there a huge swathes of the UK that feel like they have not benefited from the economic resurgence. Also, the Tory vote has been divided by UKIP – it is likely to be UKIP that help get Labour into power in May 2015. Labour increase public sector workers from 4.83 million when they took power 1997 to 5.37 million whilst total private sector workers crashed from 23.8 million to 22.6 million in the final two years of their tenure as the country was on the verge of bankruptcy after 13 years of economic mismanagement by Gordon Brown. It’s going to be a very close election and anything can happen. Public Sector In The North: Property investors in urban areas particularly in the north of England and Scotland may believe a Labour victory could help property prices as higher taxes in the south are funnelled in to help public sector projects in the north. However, because the UK finances are in such a dire state from the Labour period 1997-2010 and are unlikely to recover by 2015, another spate of spending would severely threaten financial market confidence in the management of the economy and interest rates would rise as Sterling fell, leading to higher unemployment, lower growth and lower property prices across all areas – this process could take between 6 month and 2 years to manifest itself, but we believe it would or will if Labour achieve a majority, and a similar thing would happen with a Labour/Lib-Dem Coalition since both parties are broadly in the left, higher tax, anti-private sector, anti-business camp. 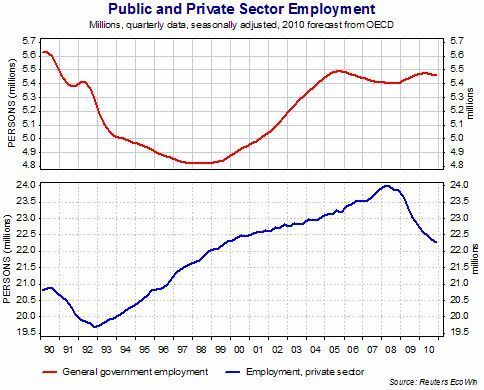 Employment: Labour increased public sector workers from 4.83 million when they took power 1997 to 5.37 million whilst total private sector workers crashed from 23.8 million to 22.6 million in the final two years of their tenure - as the country fell on the verge of bankruptcy after 13 years of economic mismanagement by Gordon Brown. 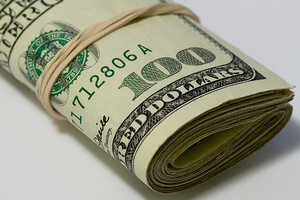 Currency Printing Debacle: What many people don't seem to realise is that all the desperate global quantitative easing - or money printing - by the US Fed, Bank of England and European Central Bank has severely distorted markets and created bubbles in lots of asset area whilst leading to lower productivity, less efficient working practices and a mirage of real econom ic growth. The $3 Trillion of printed currency seems a distant memory now, but in actuality it has manifest itself in the upper 1% of the wealthiest people in the world using this no cost currency to park in safe assets like property. This is a key reason why London property prices have shot up so fast - the correlation with the printed currency is almost one-to-one. Socialists in the US like Paul Krugman have been pressing hard for far more currency printing claiming it helps the poor - however, it only leads to higher energy and fuel prices, less efficient factories, zombie banks and the misallocation of capital – then far higher property prices in international cities where this money is parked. It actually leads to a greater disparity in wealth between the rich and poor, not less. One day, the whole fiat currency printing saga will come home to roost - with currencies collapsing and hyper-inflation, but until then, we will just see hyperinflation in property prices as the richest people take advantage of the loose borrowing for the richest and buy as much international property as possible before hyper-inflation sets in. It's a very lucrative strategy. At the end, they have real p hysical assets as the bond markets pop and paper assets crash. Manufacturing a Housing Recovery: Winding back to March 2013, it seems years of depression in the north and stagnation in the south from 2008 to late 2012 and an election due May 2015 was deeply concerning for the Tories. They had to do something to kick-start the economy. The last remaining option was to re-kindle the UK obsession with bricks and mortar and create that “feel good factor” by stimulating a strong housing recovery. Hence the Help to Buy scheme – using tax payers money to guarantee risky loans to first time buyers to get the economy moving. It worked a treat for the Tories. What they won’t have anticipated was its lack of take-up in London and its significant take up in poorer regions far from London. But this won’t upset them since this is the battleground for the next election – and increasing the number of home owners is preferred because these people tend to vote Tory. It’s been a last ditched effort after the so called austerity drive for three years, but it has clearly worked for the Tories with dramatically falling unemployment. GDP growth rocketing up to 4%, far higher than any other European country and continued low frontline inflation – allowing interest rates to remain low. It seems the scene is most likely set for Labour to dismember the good work rebalancing the economy from public to private sector - after disaffected voters switch to a spending party and big interventionist government wins the day.